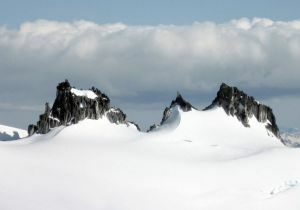 Located at the top of the ridge above the Sphinx Glacier, and south of Mount Carr. The easternmost Bookworms is the highest point. Name Notes: Named by Neal Carter, who thought one of the pinaccles looked like a monk holding a book (VOCJ 2 - 1959). Dedicated to those who study all the time by UBC Varsity Outdoor Club members. A bookworm is someone who studies all the time, instead of being out skiing.